We know that today’s parents want to be involved in their student’s education. And we know that parent involvement can be extremely influential when it comes to enrollment, retention and promoting student success. That’s why we created a parent engagement platform that turns parents into partners for colleges and universities. CampusESP helps colleges and universities focus parent involvement on student success. Read on to see how we’re making a difference at schools across the country. When parents are more engaged, students are more likely to persist and progress towards degree completion. We looked at the connection between parent involvement levels and student retention rates at schools that have implemented CampusESP. The data shows that students connected to their parents are up to 15% more likely to persist. Minority populations have the highest levels of student engagement. African American, Latino, and first-generation college families are most frequently communicating with their students and seeking information on how to better support them. Connecting with these families is an opportunity to inform those who want it--and need it--the most. — Parent of a first-generation student at Abilene Christian University. Parents using CampusESP receive regular updates about opportunities on campus, important deadlines, and student data changes. 72% of parents on our platform say it helps them better advise or support their student... and many say they are even better informed than their student! Parents using CampusESP say that the level of engagement we provide helps them feel more connected to their student, more connected to their student’s school, and more likely to maintain ties with the institution. For many families, student success represents family success. Today’s parents play a critical role in college admissions. Parents are involved at all levels of the admissions process, influencing what schools their children apply to, which campuses they visit, and where they ultimately enroll. 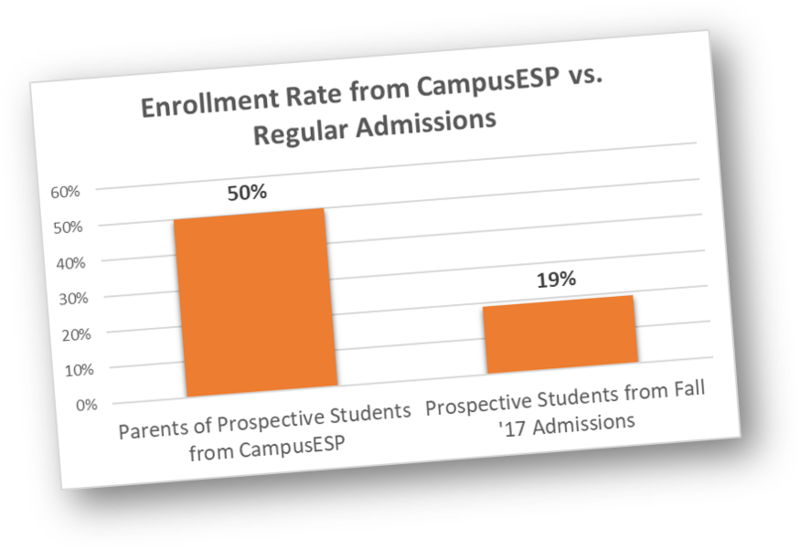 Results show that the enrollment rate for students with engaged parents in the CampusESP Family Portal are more than 30% higher. Read what parents are saying about CampusESP.